Having grown up next to the ocean, seafood has always been a joy in my life. Whether it was waking before dawn to go crabbing with family, cracking the spiced steamed crustaceans on a newspaper covered table, rendering each other covered with tidbits of salty deliciousness, or romping at communal gatherings sampling grilled clams and assorted fish, salad and corn, the memories tickle the cockles of my heart. Throughout the years I’ve had the pleasure to sample many cultural variations of seafood surprises; sushi, ceviche, shrimp and crab cocktails, pan roasts and paella, raw oysters and blackened bass, curries and croquettes. When creating seafood recipes the freshest most seasonal ingredients are my first choice. 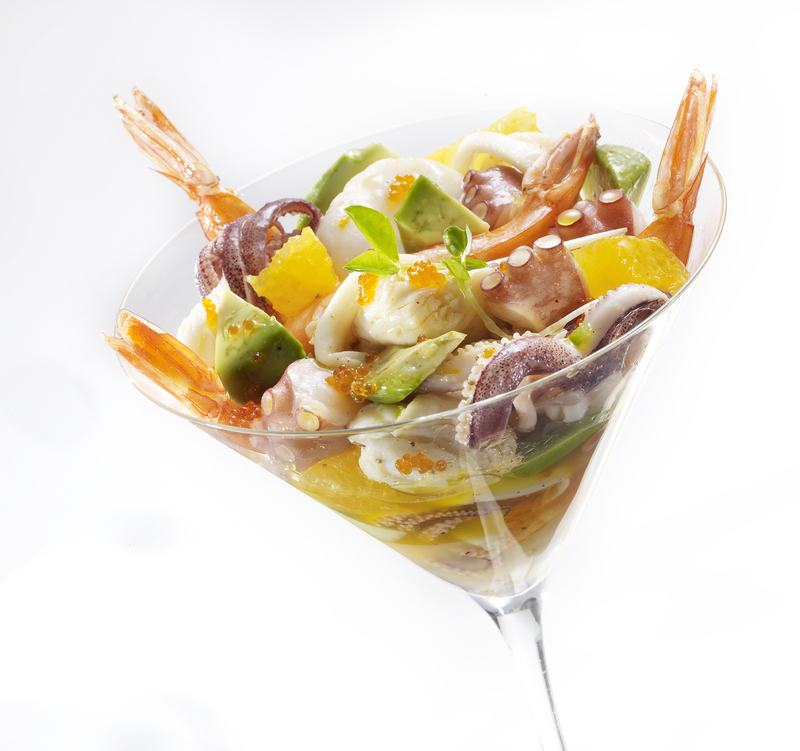 The rendition pictured here employs octopus, shrimp, calamari, scallop, and lump blue claw crab meat, paired with avocado, orange bits & tobiko. You can use what ever seafood you like, just be careful to not overcook it, leaving it dry and rubbery. The secret to this refreshing, light and snappy repast is the orange juice based marinade. The acid in the citrus and vinegar will finish cooking the flesh even if it is under cooked. For seafood lovers, this yummy cool cocktail is just what the doctor ordered. Marinate for at least an hour. It will keep in the refrigerator for days. Serve in martini glasses. Garnish with pea shoots. I don’t know about you, but I love freshly grown English sweet peas. Those delicate tendrils that emerge from the earth in Spring and Fall, winding there way to the sun and to anything they can cling to, like a baby grasping for its mother, the ripened fruit so delicate and delicious. They are so short lived, liking only the warm, yet cool Spring and Fall seasons.They cannot stand any harshness of Winter cold or Summer heat, their flowers, so ephemeral. I love to use their lovely freshness by boiling them, ever so gently in organic chicken broth, with a touch of Vidalia onion, salt and pepper. I add a swirl of sour cream and some snow crab meat to spruce it up. So basically, just boil the broth and peas with the onion until the peas are just tender. About 8 to 10 minutes. Whirl them with your thing a ma jig…food processor, blender. I like to use a smart stick hand blender. It’s just so much easier and cleaner, and you won’t have to mop the ceiling. Taste it for salt and pepper seasoning. Don’t use too much. Put a bit of crab in the bottom of each cup for surprise and a little on top for panache. Add a swirl of sour cream on top for zazz, and a dash of sea salt and pepper. 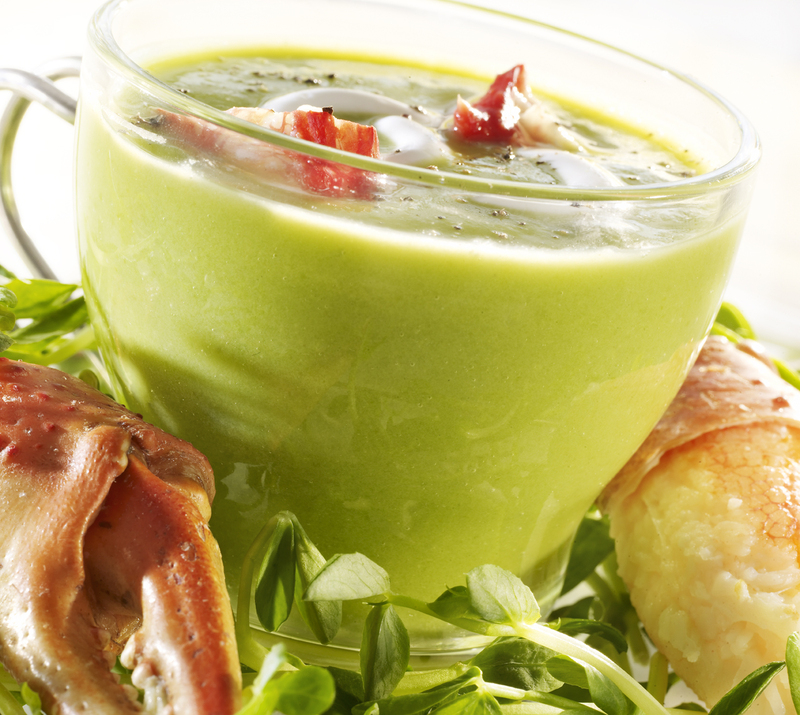 Garnish the plate with pea tendrils and crab claws, if you want to go all out.